Our longtime friends from Edison International, whose utility clients have received more than 3000 GRID Alternatives systems across many of our California regions, have been a wonderful partner in widening solar access. From the San Gabriel Valley to Orange County, we love seeing Edison customers who otherwise wouldn't be able to afford renewables become part of clean power in our region! Luckily, they share our interest in helping those with highest need – like the Del Grossos. Last weekend, the Del Grosso family had a chance to see some of that helpful spirit in person! 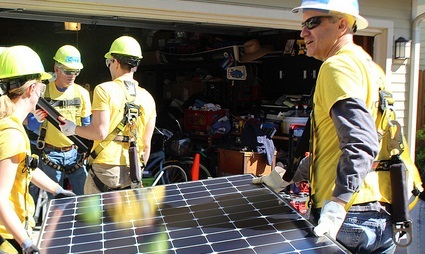 Over twenty volunteers from Southern California Edison spent Saturday installing solar with GRID's Construction team, unlocking on-bill savings that will lower the electricity costs of Edison customer Mario Del Grosso (along with his neighbors, the Naccarati family and the Nava family). On and off the roof, SCE employees showed that bringing solar to low-income communities is a team effort that takes everyone. The Del Grossos, Naccaratis, and Navas received their Monrovia homes through Habitat for Humanity San Gabriel Valley. Going solar was an inspirational chance to see that communities in the SGV still want to pitch in and help families like theirs! According to SCE Vice President of Energy Procurement & Management Colin Cushnie, who helped put panels on one of the Monrovia roofs, local actions like this enhance SCE's company-wide efforts to help Southern California make the best use of renewable energy possible. We're so thankful that he and the other team members could make it out for a wonderful day! It's a success story that couldn't have happened without Board Member Anthony Hernandez, who serves as the Principal Manager for SCE's Energy Contracts origination team – we're proud to have you as our champion, Anthony! If you know a company that might be interested in installing solar with us, and bringing a deserving family access and savings with their workday, read more about our opportunities.